How to romance a blogger – Ooh la la! In case you thought this article would be about dating or relationships, it’s not. We are all business here. It’s about getting your story told to a blogger’s audience. Whether you want bloggers to review your product or you are hoping to guest post for them, whether you have a juicy Infographic you know their readers will go all agog over, or whether you hope to be interviewed or quoted, you can’t just go in cold. You can’t just walk up to a blogger and kiss him smack on the lips. You have to romance him a little first. When you have him where the only word that will pass through his lips is “Yes”, then you can ask him to help you tell your story. You can’t just walk up and kiss a blogger on the lips. You have to romance him a little first. Step 1- follow her. Find where she hangs out. Check what she is saying. Follow her. Jeepers! It sounds like I am recommending you become a stalker. But really, there is nothing wrong or even creepy about following a blogger on Twitter or Google Plus or FaceBook. There is even a good chance that she will notice you, and maybe she will smile demurely at you. And if that doesn’t make you tingle all over, I don’t know what would. But following a blogger is just the first step. It’s like glancing across a crowded bar at her. You can romance in your daydreams all you want, but there comes a time when you have to walk across the floor. Step 2- show interest. No blogger likes to be ignored. Bloggers are sensitive folk. They slave all day over a blog post, with no prospect of reward except the possibility that this will be the day that somebody clicks on their affiliate link. But what a masterpiece they have created! Show some interest. Tweet his post. Like his post. Plus his post. Pin his post. Let him see that you’re interested. If you do this for a while, he’ll get the message. Step 3- communicate. Bloggers are not like other people. They are always off writing about this or that. They write long blog posts. They write on social media. They respond to comments. And for all the work they put into their masterpieces, they sure do expect some comments. So go ahead and comment. Compliment her on her great ideas and how well she expresses them. Add something that she missed. Share your own experience. Oh, and keep tweeting and liking and plussing and pinning. Your response to her writing will have her longing for your next visit to her blog. Step 4 – flirt. Nothing new here. It’s just stepping up the last two steps. Show a little more interest and communicate a little more. Step 5 – listen. You’ve got this little thing going on now with this blogger. But are you doing all the talking, or are you really listening? A blogger wants to be listened to. Why else would she spend so much time blogging with so little promise of reward? Step 6 – show what you’ve got. That would be a product, a blog post, an Infographic or an idea for a guest post. Show him what you’ve got, and how it might be to his advantage to take a closer look. If you have something worthwhile, and you are no longer a stranger, there’s a good chance he will make the time to consider your proposal. Write a professional letter to make your offer. Yes, keep it professional – you are romancing him, not dating him! Make sure to refer to some of your past interactions, point out how your offer will benefit him and be clear about what help you will offer to keep his workload as light as possible. Make sure he knows that you have been listening (Step 5) by referring to how your offer relates to something he has already published or mentioned. What happens if you skip straight to this step and show what you’ve got without first following, showing interest, communicating, listening and flirting? Well, it’s a lot like flashing somebody in a bar. This is what happens. Step 7 – respect her. Don’t make unreasonable demands, like that there be a certain link text or that she says something specific about your product. She controls what goes on her blog, how it looks, and what she says. Make sure she knows from the start that you’ll respect her through to the end. The blogger controls what goes on her blog. Make sure she knows that you’ll respect that. Step 8 – pick up the tab. As I said earlier, many bloggers have “no prospect of reward except the possibility that this will be the day that somebody clicks on their affiliate link”. Make it worth her while to accept your offer. Make this the day that somebody cares enough and values her enough to actually pay for all the work you expect her to do. Keep in mind that even if you present a completed ghostwritten blog post manuscript, she still has hours of work ahead of her editing, formatting, creating images and promoting the published post. Payment might not be in the form of money, or not completely in the form of money. There are some interesting ideas on paying for reviews here. Step 9 – show that you still care. Help promote his post on social media. At very least, share it on your own accounts. And say “Thank you”. That is the magic word that keeps the door open for a second date, which is something most people forget about in blogger romance. Offer to help by sharing future posts, contributing to future posts or whatever way you can think to be helpful. The second date is much easier to score, and can be just as profitable as the first one. Go for a long-term relationship, as Jeff Foster explains. If this all seems like a lot of work, it’s not really. It’s called “networking” in the business world, although I like the term “romancing” more. And if you go for a long-term relationship, you can romance that blogger for years and years. You don’t have to settle for a dozen one-time dates, when you can have a dozen brand ambassadors talking about you for years. Bloggers are easy. Sometimes they are cheap. But they never ask for an exclusive relationship, so you are free to flirt with as many bloggers as your beating heart can handle. Ooh -la-la! This is an interesting way of how to get blogger’s attention lol… but the steps you provided here are ones that I have been using for the past couple of years. And might I say it works quite well. Especially when you’re trying to get over a threshold when it comes to traffic and subscribers. Thanks for the share David! Have a great rest of the week! This is more or less dating and relationship tips to attract bloggers! The points made are surely on track. To get attracted to a blogger, it is necessary to showcase value through communication and engagement. Trust can be built on a consistent valuable relationship and this is what every blogger out there would love to work on. 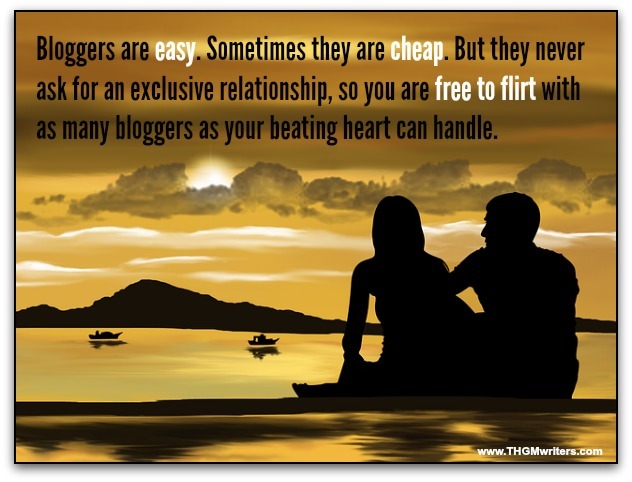 Treating a blogger like a partner can help in establishing valuable romance. Communicating, listening, following, flirting, and showing interest, caring, and respecting the blogger is all that is needed for a romantic relationship with a blogger! Thanks for these relationship tips! This comment was left in kingged.com as well. It’s very smart and creative post David! How blogging and courting a girl is alike and you’ve nailed it! Well, blogging and building strong relationships needs effort, sincerity, perseverance and your genuine feeling for blogging. This will push you to never give in because blogging is what you want and you know you will be a successful blogger worth the chance. Amazing and remarkable David. Steps and your insight must be kept in mind. Courting a girl? I made a point to make sure that we’ll be courting both men and women here. Guy bloggers want to be courted, too! This is a great blogger romance strategy. Warm up to the blogger and then go in for the kill. The biggest thing to attracting the attention of a popular blogger is to show that you can add something valuable to what they are doing. They will think that it is flattering that you have read their works and know who they are, but this will only get your foot in the door. You have to add value and guest posting, like you said, is one of the greatest ways to do that. Nice post. Hey DAVID. I must first of all appreciate you for such a great catchy headline you used. I was coming to see something insane but then you just displayed. These steps are great to to improve a healthy living and romance of a blogger. Its a nice one dear. Fun analogy and fund read, as well as very well done. Thank for using your sense of humor and creative mind. I love the mental imagery that your words conjured up in my mind. Whether you hope to be interviewed or quoted, you can’t just go in cold. You can’t just walk up to a blogger and kiss him smack on the lips. You have to romance him a little first. After I had my first decent belly laugh in days. I began worrying about you offending all the female Bloggers in the Blogosphere, then quickly wiped those thoughts away. I have recently seen you in your Dr. Who Tardis ( T ) shirt and I’m convinced that you can take care of yourself perfectly. 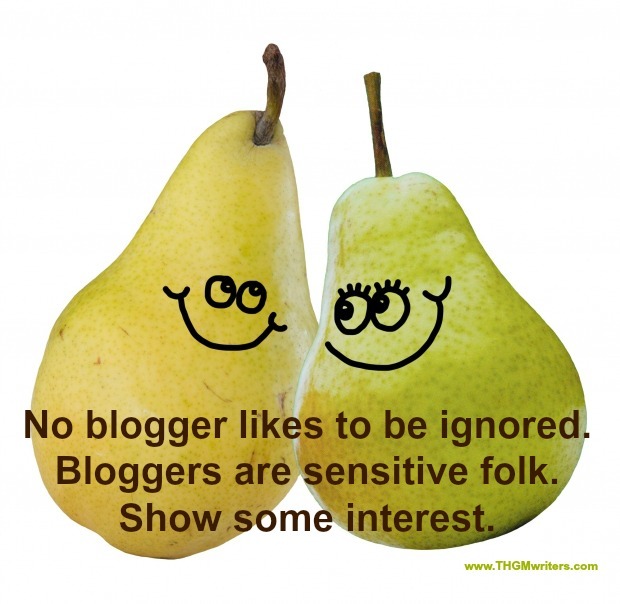 Bloggers are sensitive folk, they have to be shown that you are interested. That’s so true. I’m gradually learning the nuances of doing this without appearing to be a – Stalker. Oh do write a Blog post on how to do this effectively David, I just cannot afford to buy another pair of spectacles after I had the last one thrashed and picked up my fifth black eye. Even showing the lady your Blog post recommending I do what I did, didn’t help. (Awesome sentence construct don’t you think?). Nearly got my iPad thrashed to. Just kidding. Showing Interest. Communicate, Flirt and Listen. Ah! yes. This while I’m reaching for my ice pack. Good God! What are you trying to do get me killed? Hey I thought you were a friend. All great bits of advice to develop and sustain Blogger relationships when used as explained in this Blog post David. I will settle for a dozen brand ambassadors talking about me for years. That make real sense. I definitely picked up pointers on how to approach a fellow Blogger, engage with them, build a relationship (that’s where I’ve been failing I guess) and then add measurable value to each other. BTW, you’ve included links to some really terrific Blogger outreach Blog posts. I hopped across and read them all. Thanks for sharing this information David. I read, I gained and I am glad. I came to your site from a link on Kngged.com. I generally like to contact bloggers from a sufficiently long distance that punching me in the eye would be a very expensive proposition – not worth their time or money. I am inspired!!! I have never tried this before, but I have been curious. As a one paragraph and off to the next article reader, this was a fun read and kept my attention to the very end. I like the way you laid out this post and the tips on how to romance a blogger. Very interesting, entertaining, and valuable post you shared here! Your tips here are spot on – to romance a blogger and build a good relationship where both will benefit! When you approach people with this mentality, there is a especial energy coming out of you. They can feel it and see that you truly want to be a good friend, and that you are also a blogger who truly cares. Then, you both can hit it off, and work together to leverage each others influences in the blogging sphere! 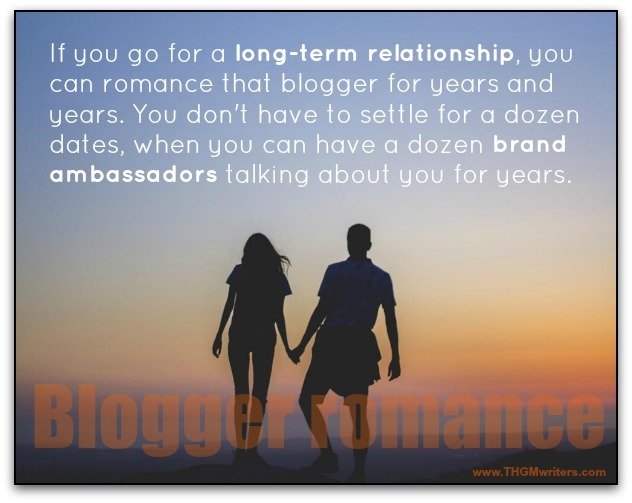 Thanks for sharing your masterpiece on romancing a blogger here! Freddy, if you want to date a blogger, like a real live one, why not? Go for it! Heaven knows, I’ve ignored a few bloggers who fail to get the basics right…this post (now) proves that they were wrong – totally! Hey Dave, I found this post at Kingged and I up-voted it and posted the above comment there. It really is giving an importance, and respect.